Just thought I'd share a recent experience. I moved from Texas to Ohio to help keep my parents in their home, they are really in need of help. I find that I have to spend so much time here that I really don't listen to my own system as much as I would like. . . I spend about four waking hours at my place on a good day. So I've been listening to my Dad's stereo a lot, and my parents are enjoying it as they have let it sit idle a lot. I bought a Pyle turntable and preamp and he has a Sony receiver and a Denon cd carousel. . .nice enough sound because it's in a custom console cabinet made for Dad in the early 'sixties with full range Electrovoice speakers within, those speakers have been giving us aural pleasure for nearly fifty years! The surrounds were redone about 20 years ago. Anyway, yesterday, doing some more unpacking, I found a big heavy Monster Cable power center I hadn't used for years because I went the Tripplite isolation transformer route and then PS Audio Power Plant Premier route. I took it over and plugged all Dad's stereo equipment into it while they were downstairs watching the news. I turned the stereo on and listened to "Stone Flower, " Jobim on CTI. I thought that there was a little improvement to the sound, more separation, a bit less edginess to the high frequencies. I let the carousel play a few cds and in the meantime my parents were back in the living room and we're talking and my Dad says "The stereo sounds really good today!" and my Mom says "You know, it almost sounds as if I'm in the auditorium!" I told them that I had added that power center to organize the plugs and protect the equipment from surges etc. and my Dad said "Well, I think it changed the sound." Surprised me that they heard the difference so easily and without knowing there had been a change. Good story Lon, and maybe a pointer to the DNA of careful listening? I'm glad that they noticed it, it validated to myself some of my experiences. . . I'm not just a crazy audiophile! Well, I'm crazy, but my audiophile observations have some merit. I've always loved this stereo, the cabinet had a Dynaco amp, preamp, and tuner in it when I was growing up that an electrical engineer friend of my Dad's had built and then given to him when he got a job in England. That's when my Dad had the cabinet made (a big expense for a preacher in innercity Philadelphia with three then four kids!) with the speakers installed. I've always sort of wanted to drop a little zen amp in here and try it out. I may do it yet. The hold up is my Dad loves his classical music station, and I'd have to have a tuner preamp or something. . . . Next time I fel like spending money on them (already lately I've bought them another tv and two blu-ray players, and the turntable and phono preamp!) I might see what the options are and drop the Eddie Vaughn modded C amp in. These speakers are awesome in this console, just have that old "alnico" warmth and are surprisingly clear and dynamic. You're a good son for moving to help your parents with accelerated living. It's a whole lot better than leaving it to The Avenging [Visiting] Angels and Life Alert. This is the hardest job I've ever had, and I'm lonely and a bit unhappy, but I have to do it. . . and for their sake I hope I have to do it a long time! The more I think of it, the more I think I need to improve their stereo so I can enjoy it more. I agree Lon. Sounds like you have a great start. I don't know what my parents had in their console stereo, but I recall a lot of tubes and loving to listen to it! Have fun! Well, after my last post I bid on and won for a hundred bucks a Marantz tuner-preamp-AV processor that should work well and allow me to drop in the C amp, so I have that to look forward to. Nice to have something to look forward to, and should be interesting to hear how the C amp sounds with these speakers, and the DAC in the Marantz might even be better than that in the carousel. Will be interesting to find out. Okay a report back. Received the Marantz AV-560 audio/video processor/peramp tuner and it was in pristine shape, all material in the original box. Hardly used or very delicately used, this was a great processor in its early days close to twenty years ago and at less than a tenth its original sticker price a good deal. I hooked it up to the Denon carousel, the Pyle turntable and phono preamp, and then routed it to the Eddie Vaughn-modded Decware C amp that I bought recently when my Torii Mk III was in Peoria for an upgrade. Things have been spinning for a while and I must say. . .NICE. The biggest diference that I noticed between this and the Sony receiver is dynamic contrast. The span from the softest passage to the loudest is more than subtly wider. My father also noticed this right off--with the right recording a very dynamic presentation is there to enjoy. The built in DAC is better than that in the Denon cd carousel by a noticeable margin. More instrumental separation, more clarity, more detail. And a bit less of an edge to the higher frequencies, and a bit tighter bass. I'm using a Creative Audio Concepts "Black Knight" coaxial cable and may later try an Amphenol glass optical cable I have on hand. The turntable and phono preamp also sound improved. The presentation is more dynamic and the tonality is mellower than that through the Sony receiver line stage. The radio turner is perhaps the same overall in sonic presentation or perhaps a bit improved. I haven't listened as closely yet. This time my parents sat on the couch and watched me make the exchange of components and connect the new ones, so it was not an "unseen" change. Still, I think they genuinely feel there's an improvement. My Dad noticed the dynamic contrast improvement very quickly, and he said that cds sounded "deeper." My Mom didn't make a lot of specific comments but she did ask me more often than before about the music, "What instrument is that?" "Would you say that music really swings? Sounds like swing music!" Several times she said '"I really like that, this sounds good." I think the Decware amp and Marantz processor are bringing out more information from the sources and letting the excellent Electro Voice full range speakers shine with their excellence. I'll probably do a bit of tweaking over the next weeks but I am going to be enjoying the music more here, which is good as I get to spend so little time listening to my own system(s) of late. Dad has this beautiful old cherry wood stereo cabinet he spent as much as he possibly could on back in '62 and it's perfect for the living room, fits into the perfect spot, looks fantastic (Mother approved indeed). It's eight feet long, speakers are centered six feet apart, and the speakers are '61 alnico magnet full range Electro Voices, just sound wonderful even today. That's got to be the centerpiece of the system, so dictated by the logistics of the room, and by Mom. So right now it's about as close to a Decware system as it's going to be with this cool little Eddie Vaughn-modded C amp unless I throw a CSP2 and/or a ZBox in between the Marantz tuner/preamp/processor and the C amp. Which I might do in time. But I'm not sure if it will add much, the C amp sounds great with the Electro Voice speakers. It may be that a better source may be the better next step . . . but Dad loves having a carousel and as carousels go this Denon is certainly not the worst. So I think this is about the most Decware this system will be. It sounds very cool ... speaking of consoles have you seen these at Symbol Audio? These beauties are stuffed with hi-end audio equipment, I bet they sound pretty nice. Nah. I don't look around the web at audio stuff. . . drives me a little nuts, I'm happy with what I have and don't need to "educate" myself or tempt myself. The only thing I really want are some more PS Audio products, PowerBases and AC-12 cords. I have what I really need, but would like about three more of each. But don't want to spend the money right now. Okay I looked at the Symbol Audio record console. It might be interesting at a quarter of the price, but 26 thousand dollars? And an Airport Express? Just not something I'd go for. 26K ... ouch! I would never pay that even if I could afford it (which I can't), however I just thought the concept was cool as I am a fan of all things mid century modern and I had never seen a console with high end gear in it like that. 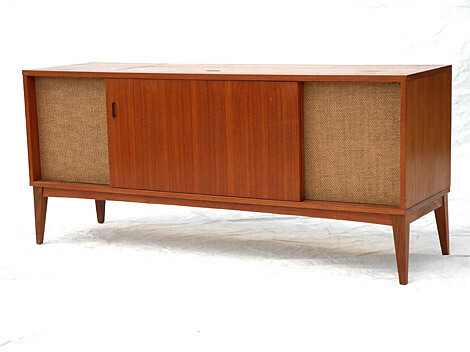 I think it would be fun (and much cheaper) to find a Mid Century Modern Console, gut it, refinish the wood on it and then replace it with that type of gear though. I can imagine picking up a Decware DIY Amp Kit and some Lowther type drivers and putting it into a beautiful Walnut or Teak console from the 50's or 60's ... It would go perfectly in my place as I pretty much have all mid century furniture and decor. I really like my Dad's, wish I could get a picture of it but that won't happen. It's really solid, three shelves inside and the audio components sit in there. Instead of long legs, it has a moulded surround I guess you would say, and sits only about six inches above the ground.It's made of much more solid wood than any console I've seen. There are four louvered doors. two over each speaker compartment and two for the main compartment in the center. I guess I need to stress this is a cabinet/component rack and not a console. Anyway, I love my Samson racks and prefer them, but these have those awesome Electro Voice speakers in it and that really makes it special. Well, the Marantz AV processor has warmed up nicely and the internal DAC has really improved Redbook sound, and the line stage and tuner section seem more "holographic" than that within the Sony receiver that was the amplification before. I added Herbie's Audio Lab "Grungebuster" 1.5" dots beneath each of the components, which has helped overrall sound. I'd love to have Tenderfeet instead but don't want to put the money into it right now. The dots get me part of the way there and I had them on hand. I also put the whole cabinet on Herbie's Carpet Spikes which I also had on hand, and that has improved the overall sound a bit. I knew I was on the right track when I was listening to a recording and a berimbau began playing and seemed to be coming from outside the cabinet and my Mom perked up and said "What was that? Was that on the record?" I think other than Tenderfeet my next step would be to improve speaker cabling and perhaps the interconnects between the Marantz and the C amp. I'm using the 16 guage Monster cable I put in there about 20 years ago for speaker cable, and Audioquest silver interconnects which I had on hand at home, those are great for the money I paid, but there's better out there. But all in good time. I have a great pair of Tara Labs RSC interconnects available, but they aren't flexible enough to use in this instance. And I have a ZBox which may be put into play, but again, that's another pair of interconnects, and another power cord. . . Sigh. Yesterday I put in a pair of cryo'd Reflector EL84s which need a bit of break-in but have added a sort of "old school" warmth to the sound and I think I'll leave in in place of the 6P15P-EV that came with the amp. I may replace the Monster Power strip with one of the PS Audio Duets that I took out of the second system at my place when I bought a Dectet last month. THAT will improve the overall sound, and at the moment I have it powering my Jazzmaster Ultralight SE guitar amp upstairs, which doesn't get as much use as my Bassman TV does. Okay, I DID replace the Monster power conditioner with one of my PS Audio Duet power conditioners and . . . wow. That made a very noticeable change in the sound. Less edge, more spatial info, more "pace." The Duet is connected to the wall with a Decware power cord. The EL84s seem a bit broken in and I like them and will keep using them for a while. Warmer and fuzzier than the other tubes in a good way. I think I'm done futzing with this until I want to spend some money and get some Tenderfeet and another power cord and interconnect to add the ZBox into the mix. I ended up putting the EL84s back in the box. Just a bit too polite and smooth after break in, great for some material, but these EV speakers like to be prodded a bit more, and the SV83 variant that came with the amp are better suited. I'll bore people a little further with the evolving stereo system at my parents' place. I knew by how audible changes have been that I can keep improving sound here as the speakers are so wonderful. I went through my audio graveyard and found two sets of three of first generation Herbie's Audio Lab Iso-Cups and three Mexican Agate balls and three Gabon Ebony balls, and placed the former under the Vaughn-ified C amp and the latter under the Marantz tuner/processor. The Tenderfeet that were under the Marantz went under the cd player. I also replaced the PS Audio Jewel power cord with a My Audio Lab "HC" power cord. I set a few cds to play and did the dishes and some laundry. In the meantime my Mom had stopped looking for some clothes upstairs with my beautiful sister-in-law Janell (and I mean that, inside and out) and had come down to sit in the living-room and listen. When I cam back with a load of laundry from the basement she said "Did you do something to the stereo? It sounds different." So I sat down and listened a bit with her and she asked me how I thought it sounded. I thought it sounded wider, the soundstage was definitely wider and imaging was even more precise. She liked my calling it wider and thought that's what she heard. I fee it is less congested, more open, a bit less warm. I have also brought over my ZBox and a pair of Audio Quest "Black Maamba II" interconnects and may use the Jewell power cord to hook all that into the system later. But it's sounding really good with just these isolation component and power cord change right now, I may decide to just leave it as is. . . . Okay, possibly the final installment, so bear with me one more time. Today the ZStage arrived. I decided to use one of the Decware power cords from my second system as I bought a replacement from Mike which will be here soon enough, and also to use the two pairs of MAC "UltraSilver +" interconnects that I had in that system in Dad's system. I set this up and WOW. This is a substantial improvement in all the "tube aspects" of sound. Haven't had a lot of time to listen, and my parents really haven't heard the new set up yet, but I know it's going to sound great tomorrow and I'm done, I now have a great system here with Decware components inside to listen to, and my folks can really relax into the music now. Yeah, I'm busy alright. It's sad. I never thought I'd be dressing my Dad and cleaning up after him in certain ways. But then I think: he did that for me. At least playing around with the stereo there is fun for me and it's interesting to see them noticing the changes and enjoying improved sound. Not that they were skeptics before, they were just. . . agnostic and unknowing about audio stuff. Lon, I can relate with your situation. My mother in law has lived with my wife and I (also in Ohio) for a few months now after she could no longer function in independent living quarters. She has a difficult time walking and is retricted to our first floor. My listening room is in a spare bedroom upstairs and I disappear every night to finish my day before bed there. She has said many times that she would like to see what all the fuss is but we can't risk even helping her on the stairs. I have been considering putting together a simple to use headphone setup for her with a CD player that she could keep next to her favorite chair. Her hearing is not good and she won't use the expensive hearing aids that she has. She can't enjoy TV becuase of the hearing but she might use music headphones if I could pick out some over the ear ones that are comfortable. I don't see myself jumping into a Taboo and high end cans but perhaps something that would be easy to use and still sound ok. I have been reading about the benefits of music therapy for the elderly and the articles are quite convincing, especially for those with the onset of dimentia. None of us should be without good music. It is my drug free way to relax each day and I'm sure she would enjoy some kind of setup. It would have to be dirt simple to operate though. You're right about the "dirt simple to operate." My Mom has dementia and she could for a while operate a tv with built in DVD player i bought her but now that's beyond her. I think music DOES help. It allows my Mom something to focus on besides everyone who walks their dog past the living room window. And when she can recognize a melody or hear the words to a song that registers, it's a nice little pleasure for her. Also recorded effects (like say purposedly distorted vocals or sound effects) intrigue her. Dad really does enjoy his "BBM" (Bach, Beethoven and Mozart) and new music challenges him. It's worth setting something up for your mother-in-law and you're right, no need for audiophile grade stuff. Dirt simple can't be emphasized enough. We have a typical HT setup in our main family room but Grandma cannot turn it on or operate it. She likes to watch TV but also can't keep up with the pace of action on virtually every show today. Music she likes. Occasionally I'll turn on a music channel from the cable box and she likes that, but I have to operate it. I have a spare CD player but its operation is typical and I have doubts she could learn to load CDs and operate that either. I have read that some facilities that cater to the extremely advanced dimentia patients have used iPods and headsets that the staff put on the patients. They use pre-loaded playlists from the patient's formative years. This seems to actually improve their responses and general demeanor. This research is interesting. I know music improves my day. Wanting to evaluate and tinker with the gear is the hobby part. Discovered that there's a channel imbalance with this ZStage in the "laid back" position which is a shame as that's my preferred spot. I'm certain it's the toggle switch, the weakest point on Decware amps in my experience. So I've been rolling tubes in the one balanced position and found I had a Mullard military 12AT7 that works best. Have never liked the tube in other applications, but it's great here. I rolled input tubes on the Zen amp as well, really trying hard to like some 6922 and 6DJ8 but coming back to the 6N1p as being the most open, less congested, sweetest treble. Sounding pretty damned good! I'm going to try not to futz with it any longer. Wish I could cure that channel imbalance because the lower bias setting is the bomb on the ZStage. Sigh. I might send it back for repair one day. I replaced a MAC HC power cord on the Zen amp with a Decware one (thanks Mike!) and that was a very positive difference. Though similar in structure (and made by the same outfit) the Decware imparts a deeper sound to the system than the MAC; the MAC is faster and maybe clearer but that's not always my preference in a system. Everything sounds good. Next step is to splice in an IEC on the Marantz tuner/processor and add the Shunyata cord I'm getting from Mike. Should be a nice addition. Well, I spliced an IEC connector onto the Marantz power cord and installed the Shunyata 3S power cord I got from Mike. I also took the Zen amp out of the maple case it was in and put IsoCups directly under the chassis. This was an improvement. The maple case looks wonderful and really dresses the amp up. . . but it muddled the sound somewhat in comparison. So now the amp is shining even more keenly. Just one more thing I intend to do and that's change the thin Monster Cable speaker cables out for something else. Don't have the something else yet, and it's a big job, so I'm holding off for a while to think of just the right speaker cables. I have some cryo'd Cat-6 on hand. . .but not sure that's the right speaker cable for this application and I want to do this ONCE. . . . Maybe later this month I'll be ready. Two changes to the system that have influenced the sound in a different/sometimes I think positive way. I replaced the Decware power cord feeding the PS Audio Duet with an Analysis Plus Oval Pro power cord. I've been really enjoying the balanced and natural sound of these cords with my instrument amps, and wanted to try it with my Dad's system. It softened the dynamics somewhat, not a lot, but it also tamed a lot of sortof wilder high frequency energy. I then tried swapping out the MAC HC power cord I was using on the Marantz AV processor with the Shunyata cord that I got from Mike (which was seasoning in my second system driving the Sony ES Blu-ray player). The Shunyata sounds much better in the system now. There is a sacrifice of lower bass with these two changes (just a bit) but the midrange is just as open and the high frequency response seems sweeter. My Mom likes it. My next change will be speaker cable. I bought Mapleshade Double Helix Plus to try in my systems. . . will break it in on the second system when arrived (Mapleshade is often quite slow to ship). I will then take the PS Audio xStream Statement speaker cables I use there and put them into my Dad's system. I know that these Statement cables will bring out every ounce of bass in the system, and give a very nice, natural, smooth sound. I loved these in my main system, but they were not long enough to be of use. Will be very interesting to hear these in Dad's system. Well the California Audio Lab CL-10 was a bust. Not reading discs properly Too bad as this is a beautifully built unit, and the changer transport is the nicest and heaviest duty I've ever seen. That said the Denon is doing a decent job as a transport and I'm just going to be happy with it. My new CSP2+ is shipping very soon so I'll be putting ye old CSP2 into Dad's system and that should be a joy. I guess I missed the part about you picking CL-10 up? Also, thanks for all the detailed posts about the power cables, very interesting and you have given me a few good ideas to try once I get to that point. I talked about the CL-10 here somewhere. Yes, it's nice to be spending all this time with my parents. Would be really nice for all of us to be spending less! Well, I'm very happy with the Mapleshade Double Helix speaker cables I put into my main system, so I put the Decware Styx speaker cables I had been using for years into Dad's system, replacing some thin Monster Cable wire I put there about ten or more years ago. This has really removed my biggest complaint about the sound of that system, a treble grit that was most apparent using the MAC Ultra Silver + interconnects (those don't leave anything anywhere to hide). 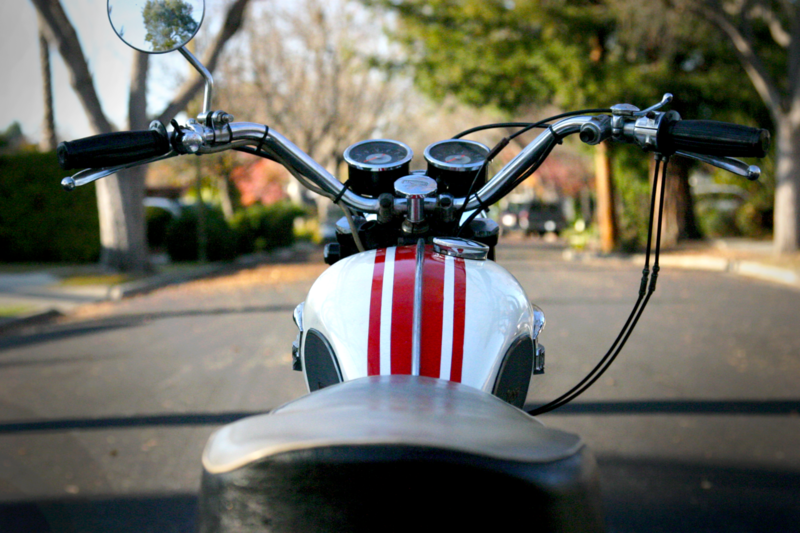 The sound is smoother and yet no detail is lost. Interestingly the sound-field has narrowed a bit but that's fine. Really enjoying the sound. This particular change is very important to me but my parents really haven't noticed it. I think it's because their high frequency hearing is more compromised than mine. My next plan is to splice an IEC connector onto the Denon cd carousel and try a few power cords there to find a good fit, should make a bit of difference in bass response and dynamics. And then when my new CSP2+ is back from Decware (I'm sending it back because the stepped attenuator was not added as I requested) I'll put my trusty old CSP2+ in place of the ZStage and expect an improvement there. And then whenever Bob completes and ships my second pair of HR-1s I'll put the ERRs in this system and I expect to really be wowed! Well, I am there almost all my waking hours, every day, so what I'm doing is trying to give myself the best listening experience that I can as I listen to their stereo far more than I do either of mine! Cabling is so interesting. I pulled a Decware cord from the system that was feeding my PS Audio Duet before because with the earlier speaker wire I found that an Analysis Plus Pro power cord made the treble sweeter at the expense of a bit of bass. Now with the Styx in place, I put the Decware cord back in between the Duet and the wall and left it warm up over night and now the bass is back, a bit of body is there that wasn't before and the treble is still fine. Sometimes tube rolling and cable switching drives me nuts, but I have learned how things interact and sometimes you can improve your sound easily using them. Man, the Styx have really made a difference in this system. Just dialed the frequency balance in and has really increased the "PRAT" factor. OH Man Lon! 4 1/2 months wait so far for your HR-1s? I ordered mine on September 19th....which would be Feb. or March 2014 arrival with some luck. Yesterday I finally unpacked a pair of Zu Audio Soul speakers and have begun the very painful break in, positioning and tweeking...still not there! I hooked them up to an old Kenwood SS Amp and I'm beating the piss out of them with high volume Led Zeppelin II over and over again....they must submit! Mark. PS...of course I'm not in the room while this torture is occurring. Megadeath works well for speaker break-in! I think Lon's wait was exacerbated with Bob's heart surgery and recovery taking him out of the shop for a while. I'm sure he'll get caught up soon. LR, I'm not familiar with Megadeath. The fact that you're 14 years younger than I am may explain this. I have the CD Box set of Led Zep's studio work...plenty of speaker abuse in there... Mark. That was somewhat tongue-in-cheek recommendation. You really have to like Megadeath in order to want to beat speakers up with it. I've gone back and forth with output tubes in this hotrod C amp and have decided to stick with cryo'd JJ EL84s. They just have a richness that the system loves, even if they are a little slower. I should have my new CSP2+ with beeswax caps finally from Decware today and will put my trusty old CSP2 in Dad's system shortly thereafter (though maybe Saturday as all of Friday will be taken up with a very important medical test for Dad). Immediately I can tell the difference: robust sound with body. I really like what the ZStage did but this is clearly more to my preference, even with brand new 6N1Ps in all positions and an RCA 5Y3GT that has seen a lot of use as the rectifier. Should be even sweeter as the new tubes "burn in." (Interestingly Steve sent me three with silicon damping bands on them, never done that before). I imagine that would be a fantastic sounding system when completed! At the moment it's limited by the cd changer. Dad doesn't want a single well cd player which would allow me a lot of choices, even a few of which I have on hand. The Denon changer is okay as a transport and the Marantz tuner/processor is a little bit better as a DAC, but I'd rather have a half a dozen other possible combos in use. I picked up a CAL-10 which is supposed to be the best changer ever made, but it is having a problem that may be laser related, I'll take it apart and see what I can see of that and see if there is anywhere that I can get it serviced/examined. With a better transport I could consider a better DAC. And have a magnificent system. The room is very good, just naturally, and that's a killer foundation. Wish I had that room at my place. I used a Shunyata "Venom S" for source components. It really does lower noise within the component, more so than the HC did. As this is a tuner/DAC the change was actually visible on the FM tuner meters. Sound was really nice, but I wouldn't use this cord on amps, it's designed for smaller current draws. This cord really needed burn in even though I bought it used from Mike. It took a week idling on another component for it to show its warmth, which it has. Thanks. I've been wondering whether one of the better lower cost name brand cords would make a difference. The Focals are powered speakers, each with a pair of 25w AB amps for highs and lows. I should ask them if the S would cut it. I would think the regular Shunyata Venom would be a better fit. I think it's less shielded but it's beefier and they RAVE about that cord all over the internet. Yes it's more expensive but for an amplifier I would think it would be well worth investigating. Here's the info for Venom Source from music direct. I highlighted the final bit of the description. A much needed complement to the Venom series, Shunyata has created the Venom 3 Source, designed specifically for lower current draw components such as CD or Blu-Ray players, turntables, phono stages or even preamps. The Venom 3 Source delivers most of the performance of a standard Venom 3 on source gear for a fraction of the price, making this perhaps the biggest bang for the buck cable Shunyata has created in years! Essentially identical to the Venom 3 but with smaller 14AWG conductors, the Venom 3 Source is the perfect way to upgrade any system. The Venom 3 Source feeds your components more power, faster, with vastly lower distortion than stock power cables for an instantly audible improvement in tonal richness, imaging/soundstaging and overall dynamic range. Although the Venom 3 Source may be used on virtually any device, we highly recommend that amplifiers, power conditioners and any other high-current draw device use the heavier gauge Venom 3. Yes, I read that, and Shunyata is not alone in this cord distinction. I can afford Venom 3, but it's the "high current" that's made me wonder. I didn't think powered desktop speakers are high current, especially given that this nearfield setup isn't about loud volumes (sitting 3' from the speakers in a spare bedroom). The specs show 47k ohm impedance, fuse rating 800mA.